100 Days of African Fashion is my way of making fashion more accessible to the 'everyday' consumer by taking it away from runways and highly editorial look books into the every day using me as the primary “model” for the campaign. In it’s first run, 100DAF begun with clothes I previously owned from African designers that I had collected from my travels. It featured a lot of African print textiles but I knew there is more beyond wax print, thus, this year I want to show design outside common misconception about “African Fashion”. Moreover, I run a fashion “brand” consultancy company so it is important for me now that the campaign’s continuity is relevant to the needs of the consumer market. This year, we are listening to concerns of those who follow the campaigns. We invite followers to like the pages of the brands we feature, we also engage designers to interact with the audience and grasp feedback from the featured posts among other issues. In addition, 100DAF was previously run as a personal project but it soon became an additional channel for designers to connect with their potential consumers. With this in mind, I quickly saw the need to feature more current collections and that is a strong component of this years campaign. We are also looking at designers from more countries, trying to make the campaign more representative of the continent and designers living in the diaspora and all across the world. Other changes we’ve made are that we’ve now included a better photographer and we now have a “more managed” digital campaign team working behind the scenes to satisfy questions from followers. Last year I featured 137 unique brands; this year I’m aiming for at least 200 African fashion brands. 100DAF has served as a useful tool for understanding what the consumers want or expect from African Fashion brands and so the campaign has served as a great resource for research. Some of the biggest challenges we’ve encountered include the following. As a pan African campaign, we receive clothes from around the continent and even as far as the US and Europe. The high custom taxes charged to receive packages are a burden. In addition, delays at customs and the postal service means that its difficult for brands to have reliable delivery timelines to consumers for purchased orders. Sizing still remains a challenge on the continent – are we UK or US 12, which metric for M, S, L? Most designers still manage most aspects of their businesses themselves- so responses to orders/inquiries are often delayed – a factor which greatly affects consumer confidence. It’s imperative that these issues are addressed if we are to trade across the continent. To complete the campaign in itself is an accomplishment for me. Last year I featured 137 unique brands; this year I’m aiming for at least 200 African fashion brands. In addition, my team and I are working with a couple of designers featured to be part of a pop-up event early 2016 aimed to sell their spring 2016 collections. What's your opinion on the current state of African fashion, more so in Kenya? Fully acknowledging the strides we’ve made as a continent in African fashion, the success of independent fashion brands will be dependent on how accessible they make their products. Bloggers, personalities, artists and celebrities have contributed to making visible amazing designs but we need to convert this publicity into access of products. 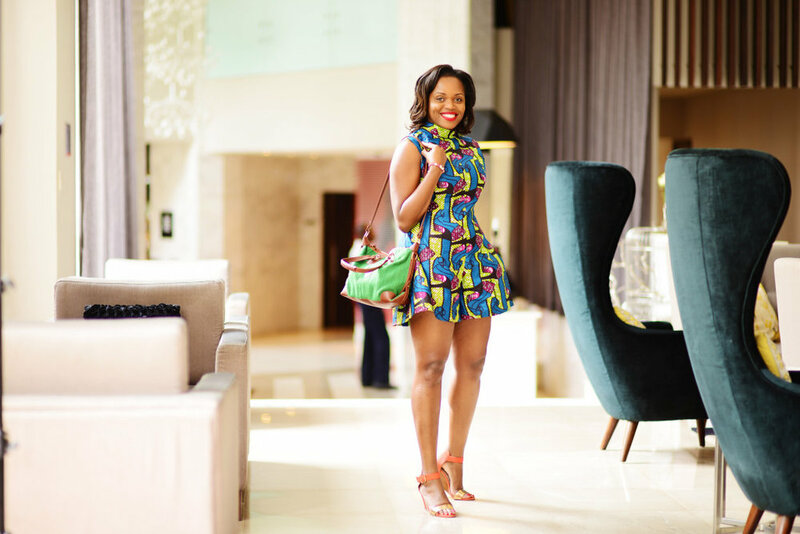 What's next after 100 days of African fashion with Diana Opoti? 365 days? I wear African brands every day, for me this is not a publicity stunt. It’s a way of life I want others to emulate. The campaign is designed to create a period of anticipation across the 100 days – long enough to introduce new brands, showcase emerging ones and “listen” to consumers as we feature African fashion a day at a time. At the end of this season’s campaign – I will have showcased 200 + days of African Fashion. The campaign will continue annually with improvements including offline and online platforms to cross promote featured brands. In the future, it is my vision to include menswear and also do a series of collaborative posts with personalities and key bloggers on the continent. Key to note, 100 days of African fashion complements other work I do in promoting African fashion brands and runs concurrently with my fashion consultancy.